Originally published in 1993. This book explores the process by which individuals reconstruct the meaning and significance of past experience. Drawing on the lives of such notable figures as St Augustine, Helen Keller and Philip Roth as well as on the combined insights of psychology, philosophy and literary theory, the book sheds light on the intricacies and dilemmas of self-interpretation in particular and interpretive psychological enquiry more generally. 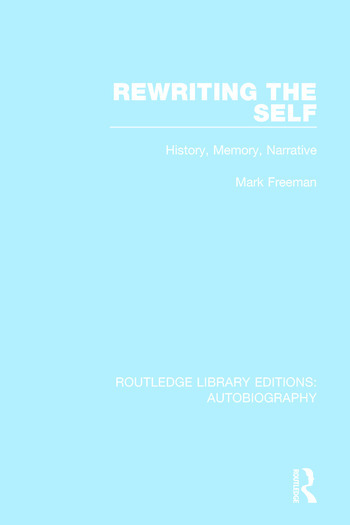 The author draws upon selected, mainly autobiographical, literary texts in order to examine concretely the process of rewriting the self. Among the issues addressed are the relationship of rewriting the self to the concept of development, the place of language in the construction of selfhood, the difference between living and telling about it, the problem of facts in life history narrative, the significance of the unconscious in interpreting the personal past, and the freedom of the narrative imagination.